Windows has always done a decent job of giving the masses what they need but not always what they want. Making everyone happy is a hard thing to figure out. However, to remedy this, a lot of different apps and add-ons are out there to make sure you can set up your Windows machine just like you want it. 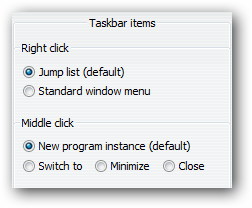 One of the most underutilized sections of the Windows screen is the Taskbar. 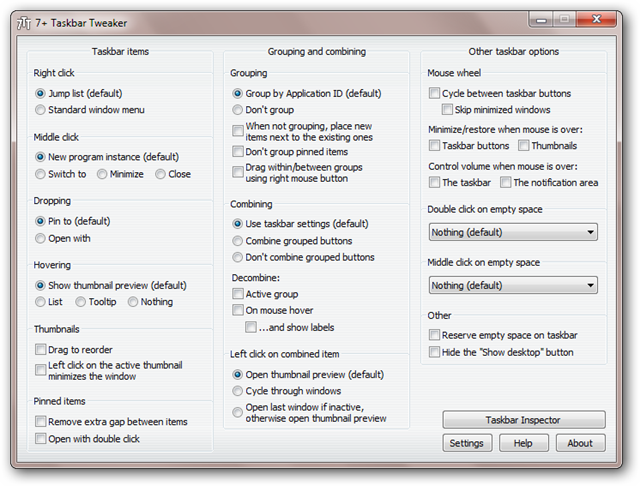 7+ Taskbar Tweaker will add a lot of customizable options to your Windows taskbar. Most people see the Windows Taskbar as a place access open applications. In reality, it’s a great tool and if used correctly can really increase productivity. Once downloaded, you can run the pretty straightforward installation wizard. The standard options such as selecting a start menu shortcut, desktop shortcut and installation location can all be chosen here. This is one of the few software installation wizards that doesn’t seem to try and add extra software or trick you somehow. After the install Is complete, there’s one last choice. 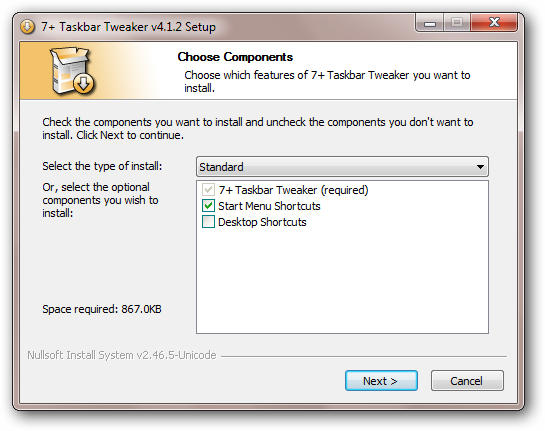 Choose if you’d like to have 7+ Taskbar Tweaker start when Windows starts. You will probably want to check this one otherwise you’ll need to start it up every time you restart your computer. The settings are what really makes 7+ Taskbar Tweaker special. While it may look like just a bunch of different checkboxes, there is some pretty powerful stuff here. Let’s walk through some of it. For starters here’s your main window. 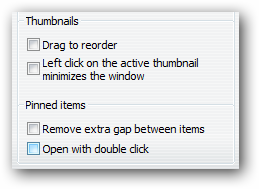 The first couple of options in the first column deal with clicking on the items in the Taskbar, specifically right-click and middle-click. If you are a mouse user, the middle button normally opens a different instance of the app. For example, if you’re using Google Chrome and middle-click on the icon in the Taskbar, you will get a whole new window. Changing these options gives you more control over what your clicks do. 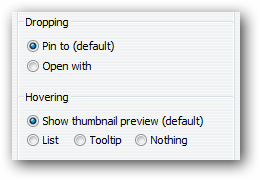 The next section about pinning and what happens when you hover over something in the Taskbar. By default, if you hover over the items in the Taskbar you will see a thumbnail image of the app. If you’d like something else like a simple list of what’s in the group (e.g. active web page names for each window), you can enable this change. Speaking of thumbnails, if you like seeing them when you hover, just want more control, you can select one of the options in the next couple of sections. These are personal preferences and only if you have the thumbnail option active. 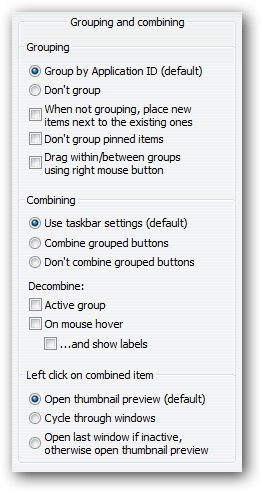 The middle column of options is all about grouping the items in the Taskbar. A couple of the parts I found to be useful is being able to not group items but keep them next to each other in the Taskbar. The other settings are more miscellaneous than anything. 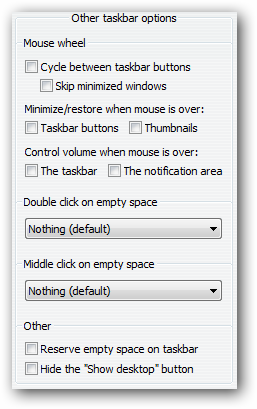 In the last column, you can see some of the other mouse controls and Taskbar cosmetic settings. To see 7+ Taskbar Tweaker in action, here is a demo video. They show the options pretty quickly nut you can see what’s available. 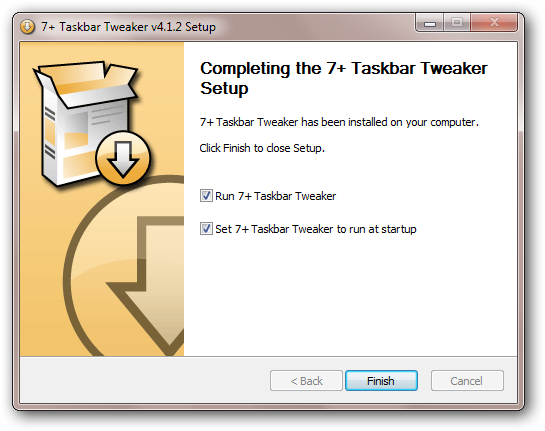 7+ Taskbar Tweaker isn’t an add-on app to add a lot of flair to your Windows 7 or Windows 8 Taskbar. In fact, many people looking over your shoulder wouldn’t even notice anything was different. To me, that’s the sign of a great plug-in or add-on app, it works seamlessly.